When you have pets accidents happen, even on your beautiful hardwood flooring. This is a guide about removing pet urine stains from hardwood floors. The best idea for soaking pet urine from the cracks in the wooden floor is to sprinkle baking soda on the boards where needed. Leave it for an hour or two and you will actually see the urine sucked up like a straw. You must repeat this a few times. Susan, I have two chihuahuas and a cat. Most of my home has hardwood floors. 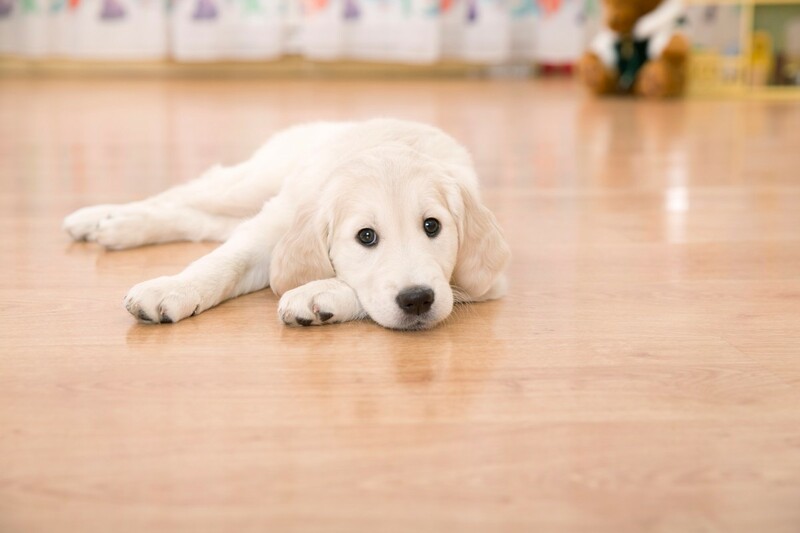 Pet urine leaves black stains on hardwood if left for even a very short time. Due to lots of cleaning, my floors have little of the waterproof seal left on them. Although trained, my pets would overshoot the puppy pads, or refuse to go outside during inclement weather. Somewhere I had heard that baking soda might be effective at lessening stains. The trick is to clean and dry the wet area, once discovered, then put dry soda down afterwards. It is amazing how effective it is at stopping stains from darkening. I think that it isn't a good idea to actually use it wet, it seems to remove moisture and neutralize compounds in the urine. Its pretty amazing, easy to sweep up dry, and no odor remains after use. Question: Does Dog Urine Stain Hardwood? I'm getting a new puppy and have all hardwood. It is an old house so the hardwood is real wood not the new laminate they have. Will urine cause any stains on the floor? Even if I should get it up quickly? I can't potty train her for another month because she is only 2 months old. Thanks. Yes, When our family moved into a home the hardwood was ruined by a dog. The spots were black. We tried sanding, but the stain went to deep to remove! The longer you wait to potty train, the more the dog will be set in her/his ways. They'll usually keep going back to that same spot(s). Can you buy a shaded kennel for outdoors for one month? I've seen them for under $200 including the canopy. Two months old isn't too young to get right into potty training--in fact, it's going to be harder to let the puppy do whatever it wants around the house for a month and then try to unlearn bad habits. At two months ( and even at three!) these little guys have tiny bladders; unless you're on it, you're going to have puddles. A good rule of thumb is that the dog will usually urinate/defecate within about fifteen minutes of drinking/eating. Just as if there was an infant in the house that needed feedings every three hours, your puppy will probably need a potty run just as often--even in the middle of the night--for the next four to six weeks. After that, the dog's usually gotten the hang of it and has grown--the bigger the puppy gets, the longer it can hold its urine and feces. If it's going to be at home alone for any period of time over three hours, consider buying a crate. They usually won't mess where they sleep--it makes training so much easier. I just wanted to thank everyone for their imput on urine staining hardwood floors. I've had my puppy since the 27th. Today is the 29th and I've already succeeded in her pottying on these puppy pads. She is doing pretty good considering it has only been 3 days. I'm going to eventually put one in a cat litter box without the cat liter and hopefully she will by then know that is where she is to go. I purchased a bell from this company where you can use their paw to pat the bell, then take them outside so they can associate and eventually do it without having to coax them. She is only 1 1/2 pounds and so little right now i just want to keep training her with the pads and then maybe if she gets big enough use the bell. She will only get to be 4 pounds. Anyway, thanks so much for all your responses. Every time that your dog goes into the yard and does the deed, immediately hand her/him a treat. This only takes four or five times. I broke two in a week with this. You can pick up underpads in the incontinence section of discount stores and place them by the door if you don't get there in time, and in a crate so you don't have to wash as much. They have them in pet stores, but the are twice the price. I pulled up the carpet in my living room today and I had black spots on the floor that smelt like pee. I need a solution to kill the smell take the black spots away. I had this when we bought our home too. There is a bottle of cleaning solution that you can buy at Lowes (probably home dept too) I can't remember the name of it, it comes in a black jug. It has a I skull on it and it had "40" in the name. Anyway its a very strong cleaning solution but the smell is very mild, pour it on your floors with very hot water and take a deck scrubbing brush to it as it will take the stickiness and most of the stain up. to get rid of it completely you will have to sand and refinish. your floors. Just remember to dry your floors quickly with a towel when finished. you don't want your floors absorbing that water. About 2 months ago we paid a lot to have our hardwood floors refinished. Now I have a black stain on the floor from cat urine. Is there any way of getting the cat urine black stain off the wood floor without ruining the finish? Thank you for any help. How can pet urine stains be removed from wood floors? They are almost impossible to remove. You may need to have them sanded and refinished. If the urine went deep into the wood you may not be able to sand it out. I have oak floors that have been stained by dogs. Does anyone have any ideas on how I could wash the smells out? Use Nature's Miracle Urine Destroyer full strength. Pour or spray it directly on the stain. It worked on my hardwood floor. It removed the smell and stain. Do not dilute it. 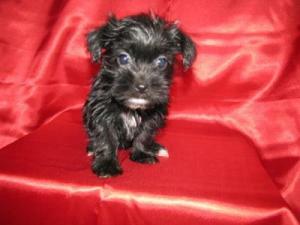 It is sold online or in pet stores. Nothing else worked for me. Good luck. I had a tenant, had being the key word here, with a no pet lease. 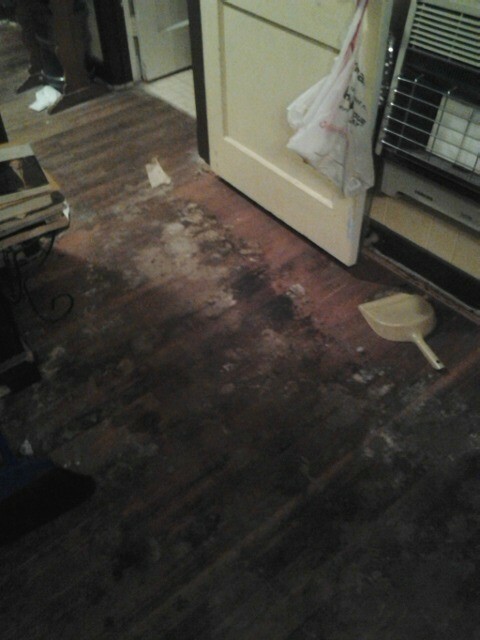 Three dogs and a cat later, my hardwood floors are a mess. I do not think the animals were let out, it is disgusting. I am hoping for a Nature's Miracle recipe for hardwood floors. Thank you! I had the same problem with a cat. It took a while to realize that the cat was peeing on the rug and that it was soaking into the hardwood underneath. When we lifted the rug, there were black spots in several places. Having removed the rug, the hardwood floors looked nice enough to try to restore, so I tried oxalic acid and other recommended remedies. The spots lighten up some, but in the end the spots never clear up enough to look decent. You will likely need to get the floors sanded and refinished. I have a pool table on floorboards, but I put felt under the legs to prevent scratches. My cat has peed on it and left a big stain. Can anyone please tell me how to get the stain off? Thank you. 3% peroxide ,put in a spray bottle and let it set about an hour. Repeat over a few days and you should see a difference . My 14 year old Schnoodle who has always been well trained to use the bathroom outside started peeing and pooping on a small rug (27 x 45) in our living room. There are also stains on the hardwood floor. I tried removing the smell from the rug, but he keeps going back to it. I'm thinking of throwing the rug out, but the floor doesn't look good with the stains on it and I can't get the stains out. Please help and give me your ideas. Thanks. I have a old home and am trying to do work on the floor. It has a whole lot of pet stains. I want to keep the floor. How do I get it out? Please help. No work on them has been done for 25 years. We had a similar problem in a new to us 50 year old house that we only saw on summer days with all doors open. Upon moving in, we found that the previous owner's dog left dark stains that smelled very bad and were all over the house. There were also older stains. After many valiant tries to clean out the stains and odor using all types of cleaners, all failed as the stains and especially the odor had seeped down into the wood. We finally replaced the entire oak floor. We filed against the previous owner who eventually reimbursed the replacement costs. Good Luck! I have two Dachshunds that have made it their business to ruin me. I don't have the money to replace these parquet tiles and knowing the maintenance of my building they will charge me three times what it's really worth. How can you clean up and get out dog urine stains and odors from this type of flooring. I'm desperate! Please someone help! We bought a house which had large feces, urine and vomit stains in the wood that were hidden by new wall to wall carpet and several odor killers around the house. No cleaning agent helped (we tried!!!) and we finally had to replace the entire wood floor in a three bedroom house. There are two basic problems with this type of stain-the stain colors and the terrible stench resulting from the organic matter seeping into the wood itself over time. The smell may remain for years so, after several weeks of gagging each time we entered the house, we finally replaced the wood floor. When animals behave like this, it usually is a sign that there is a medical problem. It's best to take the pet to a vet when this behavior begins, to find out if it has a urinary tract infection, or some other ailment. This can prevent the pet from going in the wrong places in the future. Also, as soon as this starts, you should clean and deodorize the area and block or cover it to prevent repeat offenses. What a snooty answer from someone who doesn't know how notorious Weiner dogs are for this behavior. Geesh. Try the hydrogen peroxide.. And ignore the rude person. Sorry you got trolled for such a simple thing. Use Nature's Miracle Urine Destroyer full strength, do not dilute it. It really works. You can get online or in pet stores. Do not use a substitute. 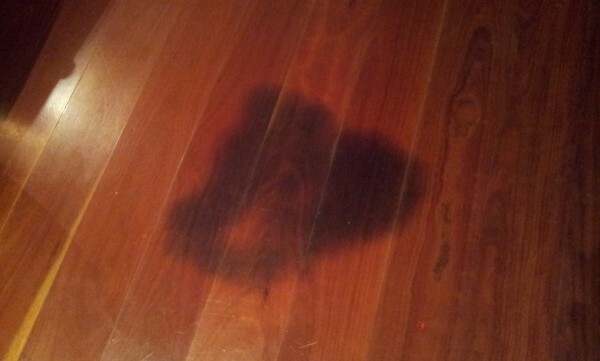 My oak floor is stained by my dog being sick on floor in the night. It is dark brown in color and the size of a medallion. Can I ever remove this? I have wiped it over and it doesn't budge. Is the oak sealed? If so you can buy wood cleaning products and mix with water. If it's sealed you can also try white wine vinegar with water. If it's not sealed the trick is to use as little water as possible. Water can warp oak. Also it's important to mop with the grain. How do I repair pet stains on a wood floor? Is there a way to restain just were the pet stains are? We had animals the past 27 years and had run into problems with only one house we rented. We used this product called odor be gone , you soak the wood once it drys you paint this other product called kills . This works permanently. They also make odor be gone in a carpet shampoo I still mix some odor be gone into the shampoo to make it stronger it works great . You may have to repeat it a few times but it will work. You do have to treat the wood and replace padding for best results. You can find this at Home Depo , that's where we found it. Good luck Penny Berry. I just pulled out the carpeting and padding from our rental house bedrooms and living room and I have tons of large urine spots on the hardwood floor. I'm sick about it. Please help. i don't have any idea where to start. I'm in the same situation. What I have found is helping, but is a slow process, is to put hydrogen peroxide on the dark spots, then after 30 minutes blot it up (it will be yellow). Do it over and over, and slowly they will lighten up. You mentioned hydrogen peroxide to remove pet stains from wood floors. This does work, but a couple notes; unless you said otherwise you are probably using household 3% solution. You can purchase near 100% peroxide at Home Depot or some such. But be careful, at that strength it will burn you, and you are looking at bleaching the wood. Which means the finish, or any color stain are all dissolved, along with the stain hopefully. The wood will need to be refinished. This is not to detour but FYI. When I bought my home one floor was heavily stained. I finish floors for a living, so I bleached the whole area, stained it a darker color and refinished the floor. At that point it was unnoticeable. Since, I have re-sanded the area and gone to a natural finish. The few remaining blotches are difficult to distinguish from the natural variation in wood color and grain. This was the result starting from deep old heavy pet stains. Lesser stains may be easier to deal with, needing only local light sanding and a little touch up refinish. It stained because, whatever, got through the finish and into the wood grain. Also, when we tear out a carpet to install wood, oft times pet odor has gotten into the sub-floor (the ply wood or particle board underneath the carpet). I can still smell it after the wood has been lain over the top, the polyurethane may seal the odor in, but you may consider painting KILNS or some other stain cover to seal the sub-floor before wood instillation. One beauty of wood is that it is durable, with care can last years and years, is low maintenance, and for the most part can always be fixed. 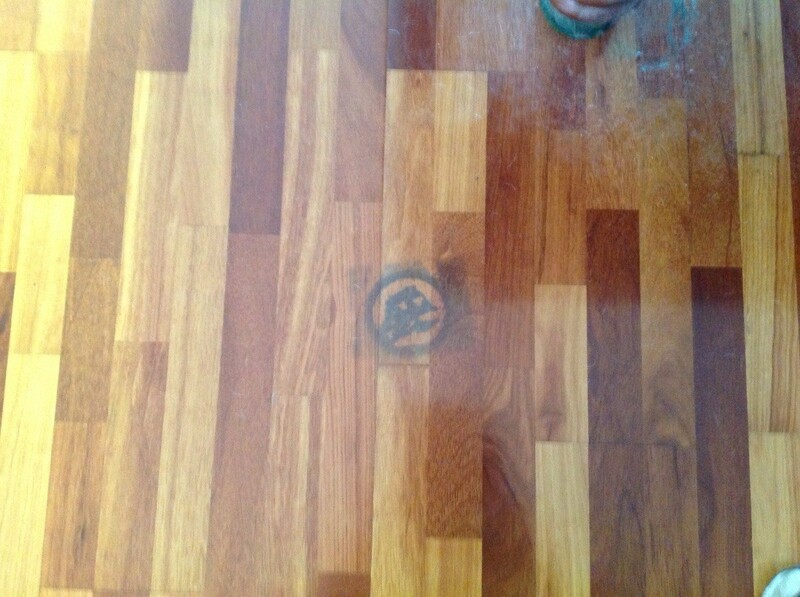 Will hydrogen peroxide bleach the timber floor lighter? We have dark mahogany floors. Will hydrogen peroxide also damage the sealant so that we'll have to re-varnish the whole floor? I'm just worried that the spot will still be noticeable if its colour changes.